If you’re lucky, you may see a vintage turquoise VW bus on the road or set up at a fair, park or festival. Sam Matthews is the driver and owner of this amazing mobile art studio, called Art Across Borders, that brings inspiration and creativity to people all over the country! Sam has always had a passion for art and helping others. Throughout college, she spent time traveling and working with kids in different countries discover art and creative work. After earning her BA in fine art, Sam continued to pursue her loves of creativity and getting involved with the community by creating Art Across Borders. Sam works with people of all ages for a variety of fun creative reasons, including private parties, lessons, workshops and even fundraisers. Through her mobile art studio, she is able to bring joy and inspiration to adults and children alike no matter where they reside. We’ve had the absolute pleasure of working with Sam on some of our unique wedding invitation designs. Learn a little bit more about Sam and her amazing work with Art Across Borders below! Art Paper Scissors: How did Art Across Borders come to life? Tell us your story. Sam: I was raised by artists and was always encouraged to make art throughout my life, and for that I know I am truly privileged. I come from a long heritage of makers and entrepreneurs, so I truly believe it runs in my family. In high school my family had a VW camper bus named Monro who became the project vehicle that my stepdad and I worked on together. He restored it mechanically and I painted it from headlight to taillight with psychedelic designs and colors. Unfortunately, a few years later, Monro’s engine caught fire and tragically burned him to the ground. Everyone was safe, except our beloved bus. After that I always wanted another VW bus in my life. Between 2011-2015 I traveled and did creative work in four different countries where my passion for kids and giving them a creative outlet grew with every mile I traveled. By the time I had to create my senior thesis exhibition at Gordon College, I knew that I had to portray my experiences and passion and decided to title my show Art Across Borders. After graduation I spent time creating my own art but had a dream to start my own mobile art studio that served as a creative outlet for the kids in my community and anywhere my future mobile art studio could take us. The idea for a mobile art studio came from my experience working for Art Feeds, a non-profit based in northwest Arkansas that exists to feed creative development and facilitate emotional expression in children nationwide. I owe so much of inspiration to them. I knew I was going to be stateside for a while and decided to make Art Across Borders a side project that first started out as an Instagram page that showcased my watercolors and illustrations, but eventually grew into something so much more. A year after graduation, after many months of planning and dreaming, I had found Flo the 1978 transporter, purchased her, and had her shipped to New Jersey to begin her transformation into the Art Across Borders Mobile Art Studio. Art Paper Scissors: What made you decide to create a mobile art studio, as opposed to a gallery or studio in one place? Sam: I have always been a bit of a nomad. My folks are divorced so I have bounced around between homes my whole life and have spent a lot of time on the road. Having a traveling business just makes sense in my life since I have always been an on-the-go kind of person. The title “Art Across Borders” in relation to my exhibition related more to the crossing of state and country borders for the sake of art. Now with the title being related to stateside work, I knew that I was going to make it relate to the crossing of county borders, state borders, and most importantly, the borders inside our minds and hearts. It takes courage to try new things and to cross the borders of our comfort zones, but that is truly where life begins. I wanted it to be a mobile effort so that people can be met where they are, both literally and emotionally. A goal of mine is to create programs that I can bring to low-income areas that don’t have a lot of artistic or creative resources so being mobile for those people is key. Art Paper Scissors: What are some of your favorite projects you’ve done with Art Across Borders? Sam: Oh man, this is a tough one. I really just love anything that someone completes and loves. It is so rare for people to actually sit down and create a project start to finish, so giving them the time, space and materials to do so is exciting for me because I get to see what they can do. I run my classes and workshops in a way that is not “follow the leader, everyone paint the same thing, boring.” I am all about empowering people to believe that their ideas and abilities are worth exploring, training, and doing! If you sit and make something from start to finish, I’m proud of you and you should feel proud of you, because I know that takes courage and ambition to see a creative project rhough to completion. If I had to pick a favorite project, I would say the string and nail art projects that I do with adults and the bubble art that I make with the kiddos. Art Paper Scissors: You are also available for event decor and painting commissions. Tell us about how you’ve incorporated your creativity for wedding decor? Sam: I’ve become a Jane of several creative trades because 9 times out of 10 when someone asks me to make them something, I say “yeah!" I don’t always know what I am doing when I start, but by the end I put it in my portfolio and get excited that I know how to do that project. I have hand-painted table signs, place cards, hundreds of bunting flags, wooden signs, food and drink markers, and now have illustrated maps for weddings and showers. I love being a part of special events in this way because those little touches really make the whole event have a unique flair that’s better than any store bought sign or decoration. I am so excited to now offer a photo booth with my VW bus for any and all kinds of events! I can book indoor and outdoor events and offer backgrounds and props that go perfectly with any occasion. I take the photos on my small or medium format instant film cameras, and I can take digital pictures of your party guests. I also offer a creation station package with the photo booth that allows guests to decorate small wooden frames for their pictures, perfect as a party favor and creative activity. I also do calligraphy, pen and watercolor illustration, and have started making pet portraits. Told you - Jane of several trades! For more information about Sam and Art Across Borders, please click here! 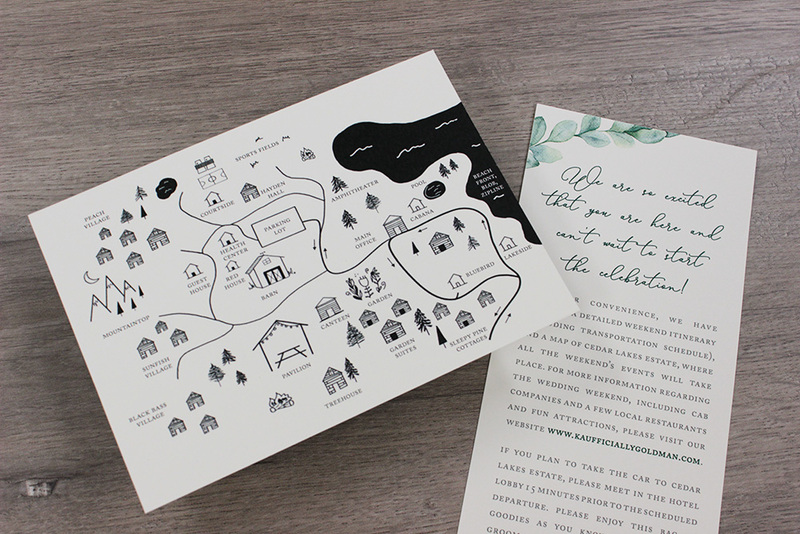 Impressed by Sam's gorgeous designs that you've seen in our wedding invitations? Reach out to Art Paper Scissors to learn how you can incorporate Art Across Borders into your own invitations! In this digital age, most of our reading is done on phones, computers and e-readers. Bending back the pages of a softbound book or ceremonious folding today’s edition of the newspaper is almost a lost art. While digital makes life easier, don’t you miss the implicit feel of where you are in a physical book or paper? That’s why this invitation is not to only be seen but touched. Every element of this invitation was thoughtfully selected to make the guests experience the feel of opening a book; from the paper to the structure, it truly feels like you’re opening up a book that is about to tell you the most wonderful secret. But it’s not a secret, it’s an invitation to celebrate the love of Faith and Michael, soon to be Krishna, at the Garden Falls at the Stone Museum in Monroe, NJ. So the invitation…it’s bound by a double belly band of a thick tic weave burlap and purple paper, inscripted with their monogram: M&K. 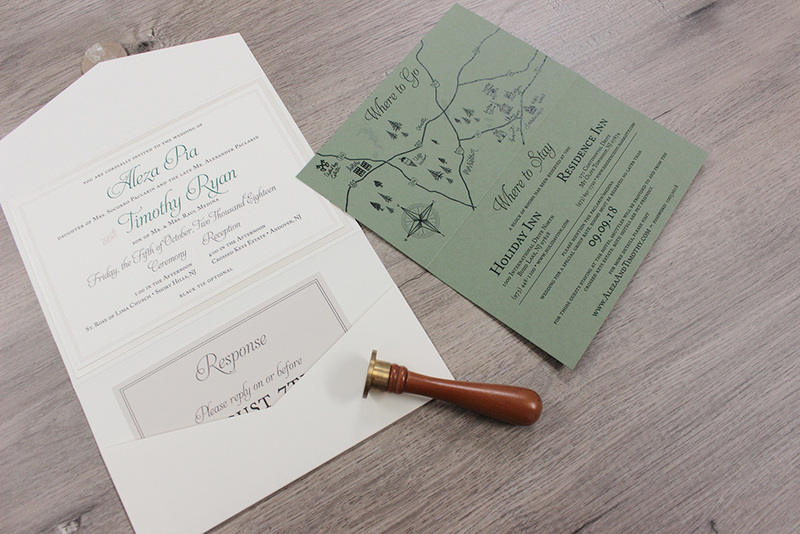 The invitation enclosure is made of a tan thick woodgrain cardstock; the paper truly has a woodgrain feel to the touch. The 2nd and 3rd page are the invitation details, bordered by vibrant yellow sunflowers and subtly accented with kisses of purple. Secured on book-end of the enclosure are black photo corners to hold the mustard yellow RSVP post card. This invitation is one for the books! Sorry we couldn’t help ourselves.